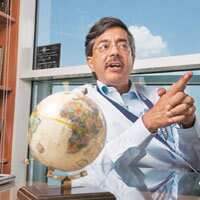 Right fit: Genpact president and chief executive Pramod Bhasin says financial services captives such as Citigroup Global Services Ltd, for whose stake Genpact has bid, will complement the company’s business and Genpact will do whatever it can to add to its already strong financial services. In the past two years you have acquired three small firms (mortgage firm Money Line Lending Services in July 2006, SAP service provider Ice Enterprise Solutions in March and Axis Risk Consulting Services in June). All these acquisitions have been in the sub-$50 million range. What is your current strategy on acquisitions? We will definitely be raising the sub-$50 million bar considerably and will be looking at acquiring companies that have revenues of $200-300 million. Since banking, financial services and insurance comprise 45-50% of our business, we will look at companies in this space. Finance and accounting, marketing analytics, investment banking and core banking are areas we can add to through acquisitions. Human resource (management), including benefits and people and records administration, is another area where we feel there is a gap. When you look for potential acquisitions, is pricing a key issue that determines whether you buy a company in India or abroad? Pricing is always an issue in India and that’s why it’s easier for us to go overseas. The valuations for local companies based out of say, the US, where margins are much lower, are cheaper. But in India you have to pay much more and the return on investments is not good. Globally, our operating margins are 14.8% and (in) India are marginally higher than that. If you acquire a foreign company, margins will be better only if you can move a lot of the work offshore. You have said that the bulk of the $494 million that you raised on NYSE will be used in paying off debts, acquiring companies and expanding your operations. Can you give us the break-up? Around $194 million will be used to pay off our debt. The bulk of the remaining $300 million will be used for acquisitions and expansion. Acquisitions are clearly a key area of growth for us and they will be to support the needs of our key strategic customers and to fill in gaps in our existing business. Have the US’ problems, related to subprime loans and credit issues, and the economy, impacted your business in any way? It will impact companies either way and that is the tricky part we need to watch out for. On one side, it may accelerate offshoring as companies fight for profits and (to cut) costs. On the other, companies may say, we can’t do as much because we have capacity in our own shop, which I want to fill first. We will have to wait and see. I don’t have an answer on how it will impact us. We have to wait for the market to unfold. The US elections are around the corner. The last time, outsourcing became a campaign issue. Are you prepared to handle a repeat of the whole anti-outsourcing issue again? We will get a lot of rhetoric. Most companies have already ducked under the radar screen (and outsourced work to India). The old days of announcing big things are over. There is a lot of economic pressure (on companies to outsource). US companies are also global companies and it is hard for them and for companies like General Electric and IBM, to stand up and suddenly say they will not outsource. We should listen respectively and sensitively. The biggest danger we create for ourselves is that we are not sensitive enough to job losses there; we better be. The reality is that it is hard to see real meaningful legislation coming through that makes a real impact. How is your effort to build a global presence in terms of operations proceeding? We are currently present in China, where we have 2,100 people. Philippines, where we have 300-400 people, is a good market for us for both voice and F&A (finance and accounting) work and we are growing at over 100% there. Over time, China’s emphasis on training and education will have a huge impact on India. In Eastern Europe, in Romania and Hungary, we have around 1,600 people. All these regions are growing fast in size for us. Latin America is another very interesting market for us. We are present in Mexico and have 2,400 employees there and will be expanding to other parts of Latin America soon. Geographically, 80% of your business is done out of India, and 24,000 of your 30,000 people are based here. What are your plans, in terms of investment, in the country? On an annual basis, we spend $80-90 million in India as capital expenditure. Globally, we typically spend 8-11% of revenues as capex. India will contribute around 80% of our total capex spend. Most of this ($80-90 million) will go into setting up special economic zones that will handle all the new business that we get. We are very keen to get into smaller tier II cities such as Bhubaneswar, Indore and Gwalior, and we will be putting a massive amount of effort into training and taking that to a different level altogether. Are you moving to special economic zones because you think the government might not extend the tax holiday under the software technology park of India (STPI) scheme for the sector beyond 2009 when it expires? Absolutely. All our existing operations are in STPIs. An SEZ, anyway, cannot take on existing work. If the STPI scheme gets extended, that will apply to our existing work and all new work will go to an SEZ. Companies like us will need an SEZ anyway because we are of (a certain) size. We have SEZs coming up in Gurgaon, Bhubaneswar, Hyderabad, Jaipur and Kolkata. Gurgaon and Kolkata are moving fast; the rest are in early stages. We are very interested in Indore and are looking for permission from the government there to set up an SEZ. We are looking at the North-East in a big way for hiring. We are pushing the government for a couple of things; we are asking them to look at the BPO industry separately from the IT industry, as it is a very new industry compared to the former. We don’t want it to be clubbed together in certain areas. This industry will be the largest private sector employer in India—bigger than IT—and employ people from all backgrounds, unlike IT that employs mostly engineers. Why are you keen on tier II cities? We want to get out from the metros and enter smaller cities and hire from them. We plan to expand our Gurgaon, Hyderabad and Jaipur and Kolkata operations. The government is not doing enough on the training front. We are proposing a public-private partnership model to the government to scale up and use existing infrastructure (in training) by working with local and state governments. We spend $600 per year per person on training and train 15,000 people every year across communication skills, US GAAP accounting (US accounting practices), etc. Finally, over 60% of your business still comes from GE. Analysts say that one customer should not usually account for more than 20% of a company’s business. Do you think this increases your risks? We do not view it as a risk. Two years ago, GE was over 95% of our business; from the $613 million revenues reported for 2006, 74% came from GE. In the first half this year, it was down to 62%. So, the diversification is already happening. Our global client growth is very strong at between 70% and 90% while our GE business, because of the higher base, grows in the mid to high single digit range. The risk here is do we deliver well or not? If not, any contract will not matter.